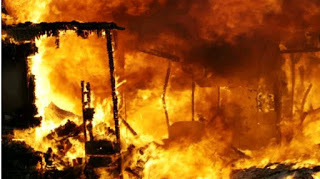 A house wife identified as Aisha has set her husband’s house ablaze over his intention to marry another woman. According to Daily Sun, it was gathered that the husband, whose name was given as Yanusa, who is living very close to Ali Bagudo’s house, Badariya area, Birnin-Kebbi, lost his first wife last year and only married Aisha in February this year. An eye witness told Daily Sun that the angry wife, who is against her husband’s plan to marry a new wife barely two months into their marriage, insisted that it is too early to bring another woman as wife into the family. It was further learnt that family members came out to extinguish the inferno, and removed few of the husband’s property.